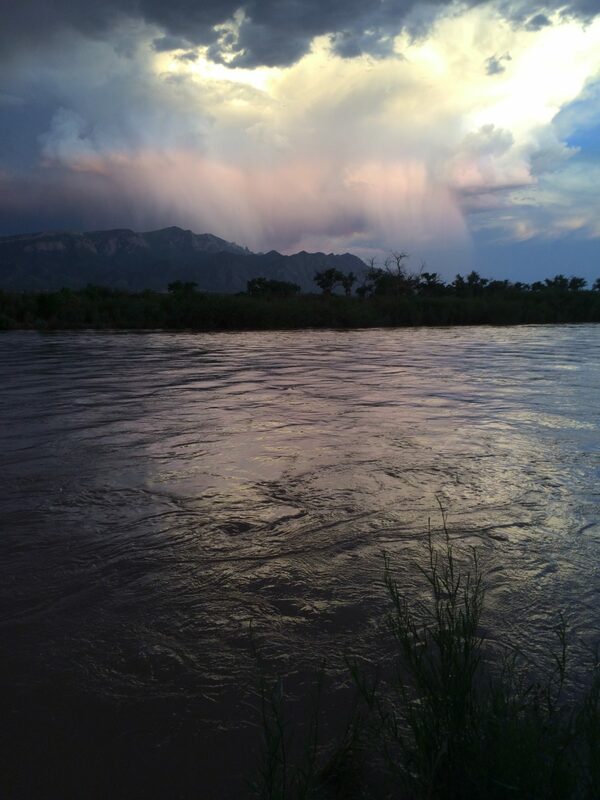 In early June, the Middle Rio Grande. The Middle Rio Grande wasn’t flowing in July near San Antonio. Whether walking along an irrigation ditch or sitting at the edge of a public meeting, I’ve listened to people complain about others taking more than their share of water from the Rio Grande. I’ve chronicled disagreements over the river’s management and watched political fights play out in courtrooms and Congress. I’ve even heard politicians blame drought conditions on the Endangered Species Act and received letters about fish that burrow into the sand to survive without water. In many ways, the confusion is understandable. Water issues throughout the arid West are complicated. And when it comes to water, people tend to stand solidly in their own camps, wielding anecdotal information when a fight breaks out. Today more than ever, as the region warms – and both our surface and groundwater supplies become increasingly constrained – it’s a good time to check the facts and try to understand one another. In that spirit, here’s my crack at a “FAQ” about New Mexico’s beloved Rio Grande. The Rio Grande flows almost 1,900 miles from Colorado to the Gulf of Mexico, passing through three states and two countries and providing water to millions of people. Its waters pour onto alfalfa and chile fields, pecan orchards, and lawns. The river supplies drinking water for cities like Santa Fe, Albuquerque, Las Cruces, El Paso, and Ciudad Juárez. Its waters are diverted onto golf courses, like Santa Fe’s Las Companas. Even factories like Rio Rancho’s Intel rely on the river: they must buy water rights from farmers to offset the effect their groundwater pumping has on the river. Signed in 1939, the Rio Grande Compact divvies up a significant portion of the river’s water among Colorado, New Mexico, and Texas. The amount of water states can keep each year isn’t based on a set number. Rather, it has to do with how much water is actually in the river that year. As staffers at the New Mexico Interstate Stream Commission explained to me last year, Colorado’s water delivered to New Mexico is based on the Lobatos stream gage on the Rio Grande near the state line. Then, New Mexico delivers Texas’s water based on the sum of the measured flow below Elephant Butte dam for the year and the change in storage within the reservoir. Colorado cannot hoard water, and Texas isn’t stealing it from us. There’s even a case before the US Supreme Court in which Texas claims that by pumping groundwater that’s connected to the river, New Mexico is taking water that’s legally supposed to flow to Texas. How is water divvied up in New Mexico? Water in streams and rivers belongs to the public. It’s held in trust by the state, which grants water rights (private property rights, basically) to farmers, cities or businesses. The system was set up in the early 20th century, even before statehood. Unlike some states, New Mexico doesn’t grant what are called “instream water rights” to its rivers. That means the Rio Grande itself has no rights to its water. Farmers typically hold older, more senior water rights; cities usually have junior rights. The pueblos in the Middle Rio Grande have the oldest and most senior water rights—and the amount of water they actually “own” has never been quantified. That, however, shouldn’t lead people to believe that tribes are taking all the water. How is most of the river water used in New Mexico? Most of the river’s water is used for agriculture. Here in the Middle Rio Grande, 70 percent of the water used comes from the river. More than 60 percent of all the water goes toward agriculture. In southern New Mexico, 60 percent of all water used comes from the river—and 87 percent of the total is used by agriculture. What’s this about a minnow? Silvery Minnow at the Southwestern Native Aquatic Resources & Recovery Center in Dexter, NM. The disappearance of other native fish species (like the Rio Grande shiner, longnose gar, and the speckled chub), and the shrinking of the minnow’s habitat, is due to massive changes in the river during the last century. To deliver water to burgeoning numbers of city-dwellers and farmers – and reduce flooding in the Albuquerque area – federal agencies worked hard to dam and divert the river and tame it to within a narrower channel. 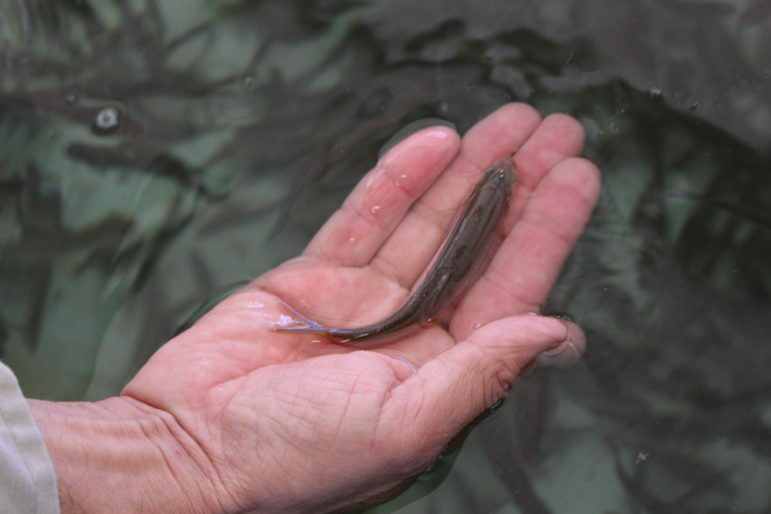 All these changes had negative impacts on native fish, like the Silvery Minnow. It was too late to save some species, but in 1994, the US Fish and Wildlife Service listed the minnow for protection under the Endangered Species Act. That ignited the need for federal, state, and local agencies to work together in order to keep enough water in the river to prevent the fish from going extinct, while still delivering water to all the area’s users. That hasn’t always been easy. And the timing of the listing is important: 1994 marks the tail end of a wet period that lasted from 1984 until 1993. Two years after the minnow was protected, in 1996, 90 miles of the Rio Grande dried south of Albuquerque. Biologists scrambled to keep the fish from going extinct. 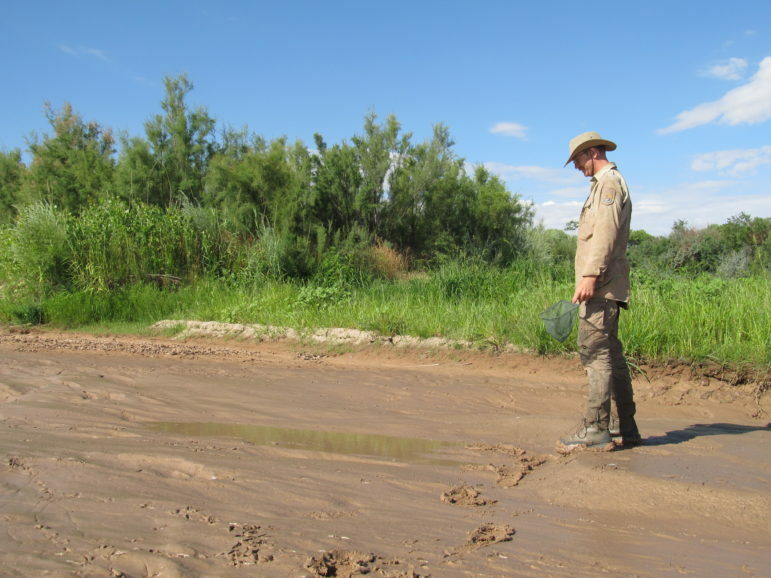 In 2012, a US Fish and Wildlife Service biologist checks out a puddle in the channel near Los Lunas. Over the years, biologists have started raising the fish in hatcheries, saving them from puddles when the river channel dries, and studying how spring flows affect the fish’s population and ability to survive summertime drying. Does the Rio Grande dry often? With demands upon the river as high as ever – and drought and climate change affecting flows – it’s not uncommon for New Mexico’s largest river to dry each summer. In the Middle Rio Grande, the channel has dried almost every year since 1996 sometime between June and late October. And since the turn of this century, the riverbed in southern New Mexico is typically dry from below Caballo Reservoir through the Mesilla Valley for up to nine months of the year. Did the Rio Grande dry in the past? For most of the year, the Rio Grande near Mesilla is dry. This is a question that has raised some hackles over the years. That’s due in part to early arguments – some of which still continue today – over how much water the silvery minnow needs to survive. Unfortunately, one of the minnow’s habitat strongholds is also a stretch most prone to drying during irrigation season. So it’s a touchy subject. Written accounts of the river date to the sixteenth century. Streamflow records go back to 1888, and more recently, scientists have studied tree rings to understand climatic conditions. There’s evidence that the river did sometimes dry in stretches. If the river dried in the past, how did the Silvery Minnow manage to survive? Today’s Rio Grande is a different river from the one that flowed from Colorado to the Gulf of Mexico in centuries’ past. That river spread across a wider floodplain where it could braid and bend. Without dams, reservoirs, and other infrastructure, when one section of the riverbed dried, water remained nearby, in oxbows or bends. Fish could swim upstream to wet areas, and later, without dams to stop them, eggs and larvae could have drifted downstream. Fish could re-colonize more regularly before the river was changed to the one that serves us now. What’s going to happen to the Rio Grande as the region continues warming? Three years ago, the US Bureau of Reclamation published a comprehensive report looking at how the Upper Rio Grande Basin is likely to be affected by climate change. The assessment looks at the river from its headwaters in Colorado to Caballo Reservoir, which is just below Elephant Butte. -Average temperatures in the Upper Rio Grande Basin may rise by an additional 4 to 6 °F by the end of the 21st century. -Flows into the Rio Grande are projected to decrease on average by about one third. -Snowmelt is expected to occur earlier in the season. Projections indicate summertime flows will decrease; wintertime flows will see less of a decrease, or perhaps even an increase, as precipitation falls as rain rather than snow. -The frequency, intensity, and duration of both droughts and floods are projected to increase. -Reduced surface-water flows, combined with increased demands for water from agricultural crops as well as other vegetation will decrease reservoir levels. -Floods are projected to become more extreme with climate change, making flood control operations more necessary, even as overall water supplies decrease. The report – which includes appendices full of information about reservoirs, groundwater, and projected streamflows – is required reading for decision makers and water nerds alike. So, what is going to happen to the Rio Grande as the region continues warming? The data’s out there. The answer to that question is up to all of us.